WorldLotteryClub is an online lottery betting service owned by Annexio Limited. Annexio Limited T/A World Lottery Club is regulated by the Isle of Man Gambling Supervision Commission under a license, issued under the Online Gambling Regulation Act 2001, on 14th October 2011. For UK clients, Annexio Limited T/A World Lottery Club is licensed and regulated by the UK Gambling Commission. World Lottery Club does not sell the lottery tickets. Members are required to place bets on the outcome of 8 national lotteries. World Lottery Club is located at Anglo International House, Level 6, Lord Street, Douglas, Isle of Man IM1 4LN, British Isles. It also could be reached by the phone number +44 (0) 208 099 70 70 and email address [email protected] The WorlLotteryClub.com website is available in 6 languages. “Are required to satisfy the jurisdiction’s licensing requirements and to comply with the stringent online gaming standards and player protection rules”. Besides single tickets in the usual EuroMillions, Mega Millions, EuroJackpot and US Powerball, WorldLotteryClub.com offers the Polish Lotto, German Lotto 6aus49, Swedish Lotto and Finish Lotto tickets. Players have the option of reading the site in English, Russian, Finnish, German, Suomi, and yes – Polish. All jackpots are posted in GBP and paid in that currency. I get that they purchase insurance just in case they don’t have the tickets – but, the T & C says the money comes from the relevant operator. Winners will be notified by email if they win £10 or more. Only winnings will be transferred to your credit card or bank account. Players cannot withdraw any amount that has been placed into their account to play. As a VIP member of World Lottery Club, you’ll be given the opportunity to play some of the world’s biggest and wealthiest lotteries such as the USA Mega Millions and the US Powerball. Annexio Limited owns and operates this site as well as a heap of others. Each site has different options for betting on single tickets and syndicates for different lotteries. They all offer snail mail and a UK telephone number and online chat. 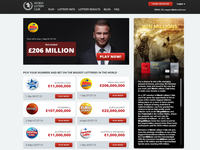 WorldLotteryClub is a legit online lottery service, fully licensed by the Isle of Man Gambling Supervision Commission. Its lottery prices are very competitive, and it offers an excellent opportunity to bet on the outcome of such giants as the Mega Millions and the Powerball. Please be aware that a subscription-based option is offered on a follow-up pop up message – if you are not interested in continuing with your chosen numbers on a weekly basis, please dismiss the relevant pop-up. World Lottery Club gets thumbs up as this lottery agent is a fully licensed and there is nothing that indicates it’s not legit. It’s quite simple to use this site without shooting yourself in the foot. When you make any bet on one of the lotteries, the flash screen comes up after you place the bet, just click on the cross upper right hand. It just kills any attempt at railroading you into a subscription. Should you get into a subscription you don’t want, cancel your card….and instruct your bank to hold further payments to the company. Never had a big payout but most of my small wins have been paid without any hitch. Just make sure you never subscribe by clicking over that x. My experience with them was decent, to be honest, I didn’t realise in feb last year I had subscribed to them, wasn’t until may I thought feck it ill see what this email is all about because I had just thought it as spam mail etc, but this email said they had been trying to contact me to tell me what I’d won, so went to the account on my phone, and noticed my wee wallet said £35,450, I though away it’s a glitch lol, just to check I bought a ticket and aye it was right, so phoned them, they gave me a cash advance of £1000, flew me over to the isle of man, hotel for the night (was the TT practises as well ;)) all food bought re-embursed, taxi to and from, when I got there they just had a chat, I met everyone that worked there, couple of pictures then flown home with money in bank lol, was rather pretty good like. I had up for a one off bet of £1.00 I have just found 7 payments of £12.00 and now I have found another payment in the same week the first was to WLC and the second is to annexio limited have rung them to cancel and cannot get in touch with them. I’m at my wits end I don’t know which way to turn to stop these payments. I bought 1 ticket $34 and now found they have taken $72 x3 ($216) I’m trying to get back. I signed up to £8.5 in June and have just realised that they tricked me into some form of subscription that fluctuates from £12 to £25 x2 being taken from my account! Issue in the hand of M&S Money fraud team and am hoping I get my money back. These people are fraudsters and the company should closed down! Do not get fooled like me, avoid them completely! My experience of them is very similar to just about everyone else’s. Signed up for £4 in February then find they are taking £15 a week. I have contacted Which? legal and Which? Magazine and the Isle of Man office of Fair Trading about them. I strongly suggest everyone else does the same. Also spoke to my bank fraud dept and World Lottery Club are well known to them so this is happening on a large scale. They need to have some concerted pressure applied. Don’t let them get away with robbery. The gambling commission is useless and you are on your own with complaints. Shut this company WLC down now. If you cannot unsubscribe instantly you should not have a license. They take from a one off purchase (cheap) on Groupon and then take what they like, in my case £17.50 per week, from your card until you realise what’s going on. Government love it though as they get the taxes. I signed for a ONE time ticket only, I have just gone into my bank account and there are TWO, yes TWO transactions within two weeks of each other for £30.00 each … I am now going to check to see how much more has gone from my account, the game I played was last December. I have emailed and tried their Live Chat, nothing. There is no phone number on their site, the one listed here I doubt will bear any fruit. I hope whoever is reading this is reading pre sign up because I wish I’d been sensible enough to check this out before, rather than after, the horse has bolted. Its proving so hard to get out!! I have been robbed by this company too. After placing a £9 bet as one off on the 9th May 2018 they started week later charging me £30 on the 16th May 2018 with out my authority. I have had the same thing happen. I’m very careful about not signing up for recurring charges and yet that is exactly what happened with World Lottery. I have had to contact them to cancel this unwanted subscription that they claim I signed up for. I did not. I signed up on the 26/02/2018 FOR ONE DRAW. Over the last five weeks they’ve taken £15 – £17 a week from my account. They also don’t allow users to delete their bank card details from the site. I’ve only just started looking, and so far I’ve found the gambling commission to report them to. I think they are breaking the law by keeping the details of the card you registered with for one bet. As they use these details to draw each week from the account. It is not by direct debit. In my opinion it’s very underhanded and they should not be using the details of the card over and over. What is the point of having a card if there is no security. Asking me for stars it would be minus 100 rating. I think it is scam. If I were to choose the numbers then fine. Even national lottery send you a an email as verification. Very unhappy. Scam all over it. I played 1 time and thought I was paying a one off payment, but this was not so and ended up £22 every week, for many weeks. Very underhanded way of taking money, as its is made clear. I am making an enquiry, I have a membership number and a password. Also your robot quiz. Each time I enter these I get knocked out. So why cant I get into my account? I was a bit new to lottery and how this worked and misunderstood the membership costs. When I realised they were taking money out every month without my playing (not my intention or understanding) I emailed to request to cancel the membership. I have now emailed 3 times over two months without any response. Signed up thinking it was a one-off occasion yet every week they’re deducting £15 from my bank account. I’m unable to delete the account or to stop payments. So far they’re taken £45 from my account without me even knowing. I would like to delete the account and would appreciate being refunded the money that has been taken. I just wanted to say – I’ve been using the site and found it to be very good and gave a speedy reply to my emails to them. There seems to be an issue with “pop ups”. It is very simple – read it before you tick it as the ideology behind it, is so you don’t forget to put your numbers on every week. Whatever numbers you play – they email you your numbers which is proof you played them. So it would be fair to say – it makes it legal between you and the worldlotteryclub. I notice that I have paid amounts of 15.00 every 6 – 7 days for 4 weeks. I don’t recall agreeing to this amount. I started off with a payment of £4.00! I have played through this site several times. Any fault on the matter of withdrawals from an account can ONLY be done with the account holders knowledge and approval. If they don’t read what they tick or sign then the onus is on them and not WLC. I’ve been playing through this site for about 2 months now. No problems for me. Actually had the “Power Ball” up 3 times and got paid. Looks OK to me. Just read the pop-ups. Be careful what you sign for but this goes for any site you join. This site gets 10/10 from me so far. I have played now for a few months. I have had no problem at all and when I did win, a small amount of money it was paid into my account with no problems. They do not take out of your account money that has not been agreed. You just have to read what you are signing up to. The intelligent observation surely is that their ability to pay [say £1B!!] is only as strong and willing as the insurance company is that is behind them. Insurance companies are not famous for being willing. Are they that strong and are they meaningfully indemnified. I put 10 pounds to play for 3 lotteries, and I have 2 pound balance left in the account, but I notice they have been taking money from my card like every two weeks. From 6 to 12 pounds. I can’t find any link to cancel or close my account. I have close my subscriptions and cancel my debit cards. I had the same problem they continued to take money, but after looking properly at the site I discovered that you have to tick the boxs or they will continue to take money. It cost me 100 pounds before I found out, they must earn plenty as this is not very clear. I chose to play once. Apparently I was served a pop up and agreed to an agreement which I never would have done and this is clearly a sneaky way to get people like me to agree to something by mistake at the end of a journey. I am talking to them now to receive the money back and I am really hoping they are a decent company who care about their customers and refund the money. I also advise you to review the journey on your site as I am not the first one on here to say this and you shouldn’t trick your customers into this which I am sure if you asked yourself, you know you are doing and I imagine a high percentage of your customer inquiries are about this very matter. I thought I was just placing one £3 bet, but find they have been taking money from my bank account twice a week and now £42 down. Apparently they sent a pop up which I clicked on and that started the process. This is unfair. This is not clear and I feel should be avoided. I did not sign up for more than one go on the lottery, but you have taken £77 out of my account. I think this is fraud, I would like to think you will give me my money back but I won’t hold my breath. I got offers to play lottery at 99p at this price I couldn’t believe it. However, I won a few times, not a lot of money just under £30. Yes, I was surprised, but what stops them from when you have a big wining paying you as you don’t have a ticket and your betting with them and not the lottery agents them selves. I paid to play ‘ONCE’ I’ve just noticed on my bank statement that they’ve been taking £25 out of my account every two weeks. Can’t find anything on their site to why this is OR to cancel it so now will have to go through my bank to stop these transactions. Good gambling site, have won small amounts; just awaiting the big 1. Changed their terms & conditions so if you were to win over £10m, you get the £10m up front and the balance over 20 years. Better off elsewhere that don’t do this. I keep getting offers for euro millions at 99p a line and it lets me put them on every time at this deal price! Not won anything big yet though! I keep getting texts from them. They say to opt out reply STOP but the text doesn’t support replies. I’m not sending them an email because I’ll probably end up getting spam mail too. They are really annoying, especially as I am very anti gambling. I joined today but I never received any confirmation of my ticket. Got a popup on Facebook that took me to world lotto club. I got 2 free lines as a welcome on the Powerball from my one line and I won $3.88!! Haha, I won so I’ll be back! In essence to the website, it is easy to use and quite good for the worlds different lotteries, just disregard the popup that asks you to subscribe and wait for your email to tell you that you have won. World Lottery Club has great support, it is 100% transparent and scam free. Poor ways to prove you won at WorldLotteryClub. I used to play at Lottoland and Lottoland sent you an email with the numbers you played. When you logged in at Lottoland you can see the ticket serial number and the numbers you played at your active games. When you logged in at WorldLotteryClub you just see the numbers you played at the active games, there’s no ticket serial numbers or bar code. As I said, I think there are really poor ways to prove you won at WorldLotteryClub, they should change that sending the numbers you played by email and with ticket serial number or bar code. As stated you are not buying a ticket you are placing a bet, therefore would not receive a ticket number or barcode. I have an email from these guys with my numbers as soon as I played. I hope this helps. I think it is okay for what it is. Unfortunately the majority of people signing up to it doesn’t know. Also, every time I do bet on a lottery it asks me to subscribe which I think is okay at the time, but don’t understand that suddenly my bank account empties as it just keeps taking money out. I would much rather be able to sign in and bet that day, not for the next however many lottos until I notice the funds disappearing and then have to log in and unsubscribe to everything. It is just a wonderful lotto betting site, it is 100% transparent and scam free, one can love by playing, it is really an excellent betting site in the world, one can blindly accept this site. I love the World Lottery Club. They’ve cleaned up their site giving it a premium feel unlike their lurid competitor. If I were to offer a bit of feedback, I’d say to give your existing customers 2 for 1 deals too. Retention is just as good a recruitment. World Lottery Club has great support and that is something that is really important to me. You can contact them over the phone or write them email, which I choose. They were really nice and helpful and responded in a short notice. Bravo! Don’t like the betting part, but still good winnings and really fun to play. I never had problems with World Lottery club. It’s perfect for lottery players and also for those who like to bet. Nice support. Agree with you Liam, love playing with World Lottery – I find that if I play more numbers in less draws it increases my winning chances and play once a week. Jackpot, here I come! Thanks for your comments, we are pleased to hear you are enjoying your World Lottery experience. Easy way to play the lotto, bought 1 Euro ticket to try (and got one Free –bonus!) won £2.80 and I used it to buy another ticket and even a Polish Lotto Ticket (at 60 p why not?). Now a regular and can’t complain as it does what it say on the tin. BOGOF is a great offer, and even better when you win first time! Glad to hear you tried an additional game “Polish” and won again. As a regular player look out for even more Offers dropping into your mail box! Best of luck with your entries. Saw the buy 1 get 1 free banner on your site and gave it a go as your review says they are legit and regulated. Won £ 2.20 on the free ticket and the money was on my player account on the night of the draw (quicker that if I bought ticket at my local newsagents). I didn’t take the subscription offer as not a regular player and not been charged since so not sure what the other user saying? I did use my winning to buy another ticket and cross finger will get my big win. We are a fully licensed and regulated company and do have some great offers available such as the Buy1 Get1 Free offer you mention. We take away all the hassle of going to the shops to buy your entries, you can do all of this from the comfort of your own home in private! And when you win you can simply play again using these winnings. Not sure what the fuss below really. Bought a EuroMillions ticket as part of get one free offer I saw on google and at 2quid for 2 tickets that was a good price. After I paid got a massive offer in a pop up to subscribe for £2 a draw and get a draw free. If you can read, it does say in bold it is a subscription and tells you when and how much will be charge. I took the offer, but when EuroMillions jackpot went I dropped them an email and they cancelled the sub the same day. I now play Powerball as jackpot massive and got a 20 quid win! I withdraw to my card and got my money within 2 days. Spot on web site, lovely team and quick service, and a great price, can only recommend. We do have some great offers available on all our games from time to time, so now you are a member keep an close look out for the offers dropping into your inbox! We do allow new members the opportunity to subscribe each entry on a weekly basis, so they never miss a draw and as you say the terms of the subscription are clearly displayed “Just above the Confirmation button”. You can cancel your subscription at anytime by contacting us directly via one of the following methods. Best of luck in the games! Please note that Cancellation requests posted on this site will not be processed as we can’t confirm the identity of the individual responsible for the post. World Lottery Club needs to verify each customer’s identity before any cancellation can be processed. I cancelled mine last year and see you have taken 8 pounds from my account on 3Rd of February. Do not take any more and I want refunding! It’s misleading and a scam. We have located an account in the name of Valerie Ainsworth and can confirm that a subscription was activated on the account on the 20th November 2015. We don’t appear to have received any request to cancel the subscription, which is why you have been charged again in accordance with the terms agreed when selecting the subscription offer. I have just purchased what I thought would also be just one nights draw and was offered extra lines for free and an entry into the syndicate for a small fee. I also feel conned as the whole process is misleading, as I only realised I was entering into a subscription when I’d given my bank details and it was too late. I trusted this site as it was advertised on The Bluelight Card site which offers discounts to employees in the public sector. I to be in the draw but not in a subscription and wish to withdraw my details from the company so I can’t be charged over and over again for something I didn’t want to subscribe to. Can you please tell me how I do this? And even get what I’ve paid refunded back to me. I feel that the advertising and promoting that this site gives is misleading and could see Trading Standards having a field day with this site and its misleading promoting and advertising. Customers can play once off or subscribe their entries. You are in full control. You have selected the subscription which is why you were due to be charged. Your account was cancelled on the 15th February. I too have been duped by this site. I phoned to cancel and after taking my name and half of my address I was told it’s cancelled. I feel uneasy after reading comments and wonder if it is in fact cancelled on the scant info I gave. I will contact my bank to make sure payment does not come out. We can confirm your subscription cancellation request was received via email and telephone on the 1st February and was processed immediately. Your subscription has been cancelled, you should have received a cancellation confirmation via email, please check your junk folder if you have not received this directly, it was sent to you @ 9.25am on 1st February 2016. The thing is, it’s a card payment, not DD, so banks can’t stop the payments from their end! I tried that and was explained to me why it couldn’t be done. Please arrange to contact us directly in order to cancel your subscription either via our support email address [email protected], live chat or telephone. We would need to confirm some additional account information to confirm we have located the correct account holder before cancelling. I’ve been caught out too! Thought I was just buying one off Powerball tickets, and now I’ve realized its not, I can’t seem to cancel it and can’t cancel via my banks end as they’ve got my card details! And getting no role to phone calls! Have mails and live in hope of reply, but not holding my breathe!! They may not be a scam as such, but they need to make it a damned sight easier to cancel!! This promotion doesn’t appear to be anything we are offering. Please forward the email onto [email protected] and we will take a look for you. I too have been caught out. Signed up to play a couple of one-off lines for the Powerball. But seems like these con artists think you want to pay continuously! NO I DO NOT WANT TO BLOODY SUBSCRIBE!! No options to tell you, no warning. Only after when you see your purchased ticket. The subscription option is offered to customers at the end of the initial purchase, you can either take the offer of the subscription, which will automatically renew on a weekly basis or decline the offer, the choice is yours. We can see that you selected the subscription offer initially but then sent in a cancellation request to cancel the subscription activated. Your subscription was cancelled immediately and no further charges were incurred. I did the same and did NOT knowingly sign up to a subscription. Was shocked when I saw £8 taken from my bank account. Wasted hours yesterday, stopping payment with my bank and also taking Groupon to task for not making it clear what was on offer. I thought I was buying 2 lottery tickets for a one off flutter on Euromillions. I did not realise it was a betting / gambling website. I recently signed up and entered the powerball draw, can I ask why when I clicked and finished putting on my lottery that it said next payment will be taking the 19th of January? I do not wish to play consistently at all and this has been done very misleadingly. Unfortunately we can’t locate your account as we only have the name “David” in this post so have addressed your comment generically. You can purchase your entries to play as a one off or they can be subscribed, so they automatically play each week, the choice is yours. If you have selected the subscribe option we will confirm the next charge date as part of the process to inform you when your next subscription payment will be collected. Should you require an further assistance please don’t hesitate to contact us via our support email address [email protected], live chat or telephone. I picked 2 lines on the Powerball — at cost of £2 plus one free draw. The £2 has been deducted yet it says “you have paid for 0 tickets” ??? Have I just been conned? We can see that you successfully purchased a single line entry for the Powerball and got one free. You paid a total of £2 for 2 single line entries. Both of your entries played in the draw on 13th January 2016. Simply login to your account to see if you won. Have been trying to cancel my membership for a few days now and no reply’s, customer service totally non existent! Will take this to trading standards if they still fail so respond! I joined the WLC by mistake when I wanted to play lottery online. My intention was to play the game once but I ended up on your website where I put my details without realising you were not the camelot national lottery website. I have had £12 taken from my account every week since the 5th of Dec & I dont know what I am paying for every week. I have tried to cancel these payments with my bank with no sucess as you take card payments. My bank has given me one option to close my bank account which I will do now to stop you from taking more money from my account. I can not afford to be in your club please stop taking money from my account. Can you please cancel my membership & the weekly subscriptions I can not afford it. We can see that you have requested cancellation of your subscription via email on the 4th January 2016. Our Website http://www.worldlotteryclub.com is clearly identified by our Brand “World Lottery Club” and has no resemblance to Camelot’s website. You took advantage of our BOGOF offer on the EuroMillions and selected to subscribe your entries on a weekly basis. By clicking the offer, you were signing up to play 3 lines on the EuroMillions (£2 per line) twice weekly which resulted in a subscription charge of £12 per week. Hi, I would like to cancel, I am also not interested anymore, I just wanted to place the lottery for one night only, I signed up and the password I got sent does not work and I can’t even sign in to my own account! And when I go to reset password, it does not work either! Can some please tell me how I delete my account as I wish to have no further interest in this site. After realising I’ve signed up for a prescription which I do not actually want I’ve tried cancelling this via email. Confident my request for immediate cancellation will be followed through after reading other comments above I’m hopeful. Unfortunately without your full name or email address we can’t confirm your identity and therefore cannot comment on your post above. We trust that you have received a cancellation confirmation related to the cancellation email you mention providing you have sent this to the correct email address as stated above. Please contact us directly if you require any further assistance. I have also been caught. I was drawn in by playing ‘coin dozer’. There was an offer that if I bought a £2 euromillions ticket then I would get 2500 coins free to play with. Unfortunately a box comes up asking you to play regularly and I inadvertently clicked it by mistake. They then proceed to take £8 from your bank account each month. I’ve had 2 ‘wins’ amounting to £15.20 but when you try to get the money out there’s always an ‘error’. I have emailed to cancel my membership but so far I’ve had no reply. I would advise people to be very careful when dealing with these people. Keep away! The offer which you clicked on was for a EuroMillions subscription. By clicking the offer, you were signing up to play two lines of the EuroMillions (£2 per line) twice weekly which resulted in a subscription charge of £8 per week. We have tried to replicate the withdrawal error which you have mentioned and found that the withdrawal completed successfully on our first attempt. I understand a member of our support team has been in touch with you to help resolve your issues and to confirm the successful withdrawal of your winnings. We hope that you are satisfied with this solution. Yes thank you the winnings have been paid to me. It seems that my browser wasn’t compatible with the google chrome that you use, hence the trouble I had with navigating your site. I was helped by a nice young lady and I do believe you’re not a scam after all but just need to sort the site out for people not so up to date like me! This scam has caught me. They have no listed phone numbe so you can’t contact them they only take card payments so you can’t cancel payments. Hi Roy, We are sorry to hear that you couldn’t find our telephone number, for future reference our telephone number is +44 (0)208 099 7070. We can see that you have successfully cancelled your games with us after sending via email. Should you require an further assistance please don’t hesitate to contact us via our support email address: [email protected], live chat or telephone. I also have been scammed I have email the company twice to cancel my subcription and yet no one has emailed me back! I strongly recommend NO ONE to use this site! They are a waste of time. And I do not want money coming out my account every 2 weeks for a silly mistake I made!!! We can confirm that we received your cancellation request on the 13th February, this was processed immediately upon receipt and a cancellation confirmation was sent to the registered email address on the account. Why do you need verify customer’s identity? If I go to bank, can I cancel?